You might think there's no wrong way to eat cereal, whether it's with no milk, lots of milk, or waiting until the milk gets warm and the cereal gets soggy. 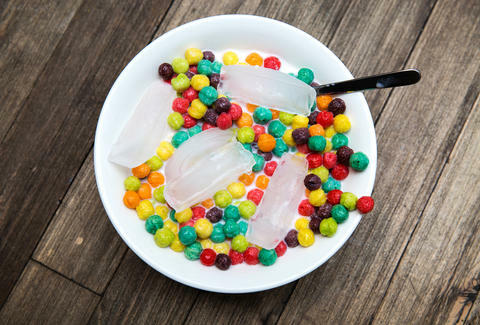 Actually, though, there is a wrong way to eat cereal: with ice cubes. This is pure madness. By adding ice cubes, these lunatics are ensuring that the final slurp of cereal-flavored milk (arguably the best part) will be forever diluted -- defiled, even -- by meltwater. What's worse, it's not even a new trend: people have been tweeting photos of this breakfast abomination for months, as far back as 2012, which can only mean they've been doing it way longer than that. Who are these hedonistic individuals, for whom normal, fridge-temperature milk isn't luxurious enough? Don't they realize they could just freeze milk in ice trays and have the best of both worlds? This aggression against milk will not stand. Yes, this is America, and people have the right to enjoy cereal however they want, but to paraphrase Sam the Eagle, that doesn't change the fact that you're all still weirdos. Think ice cubes in cereal is perfectly normal? Leave a comment below, and let's settle this once and for all.